Win a limited edition poster of Amazing Fantastic Incredible! 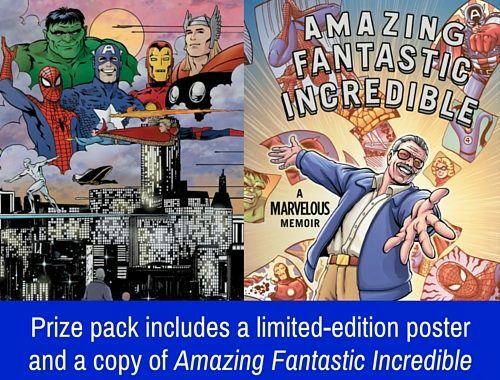 In celebration of NYC ComicCon, we’re offering 25 lucky fans the chance to win a copy of Stan Lee’s new graphic memoir, Amazing Fantastic Incredible, plus a limited-edition poster featuring some of Stan’s most iconic superheroes. And don’t forget to also enter our Amazing Fantastic Incredible pre-order sweepstakes to win a hand-drawn, one-of-a-kind print of yourself as a superhero! NO PURCHASE NECESSARY TO ENTER/WIN. Sweepstakes begins 10/6/15 and ends 11/4/15. Open to legal residents of any 1 of the 50 US or DC who are at least 18 years old. Void where prohibited by law. Subject to full Official Rules in Terms and Conditions above. Total ARV of all prizes: $625. Odds of winning depends on the # of eligible entries received. Sponsor: Simon & Schuster, 1230 Avenue of the Americas, NY, NY 10020.